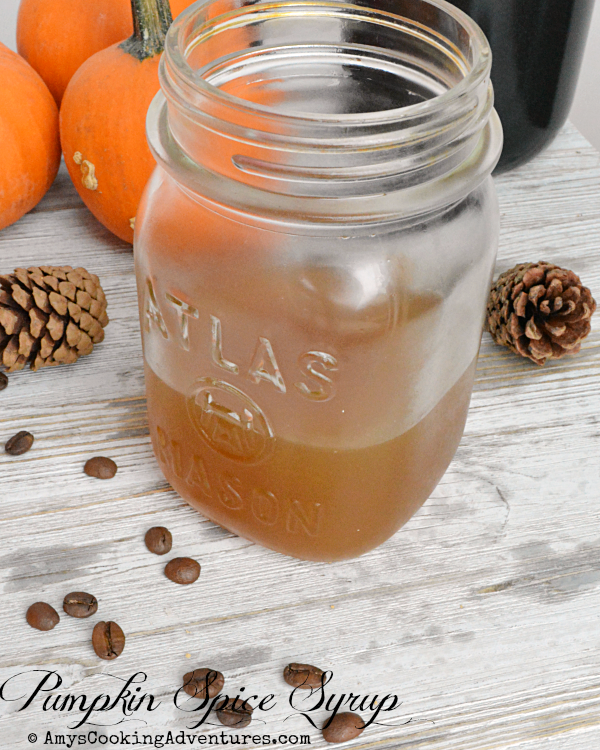 A delicious Pumpkin Spice Syrup - Plus ideas for Pumpkin Juice & Butterbeer! This month marks the one year anniversary of my boys’ introduction to the Harry Potter books! We started when Harry Potter and the Sorcerer’s Stone was rereleased fully illustrated and haven’t stopped since! 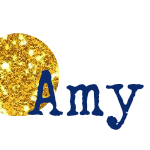 I’m currently reading book 6 (Harry Potter and the Half Blood Prince) out loud to the kids! I love being able to share one of my favorite series with my children! 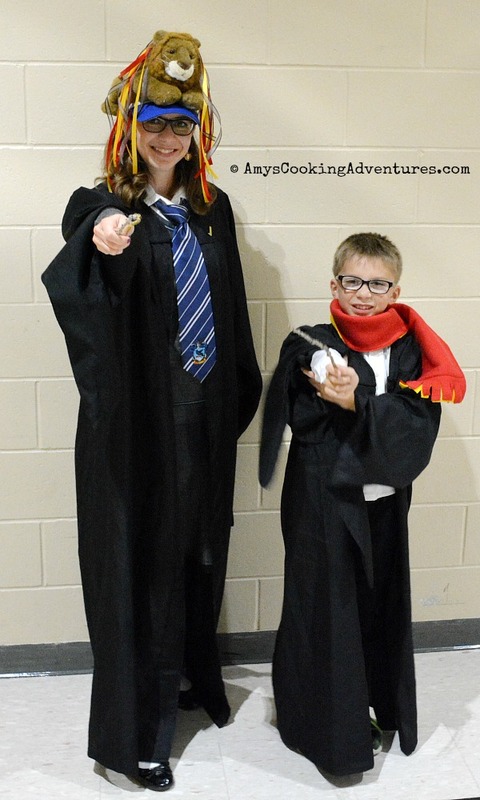 Dude and I are even dressing up as Harry Potter and Luna Lovegood for Halloween! A few weeks ago, I tried to pass off my butterscotch hot chocolate as butterbeer and the kids were super unimpressed. Spud insisted that butterbeer was meant to be cold and NOT chocolaty (and he’s totally right). 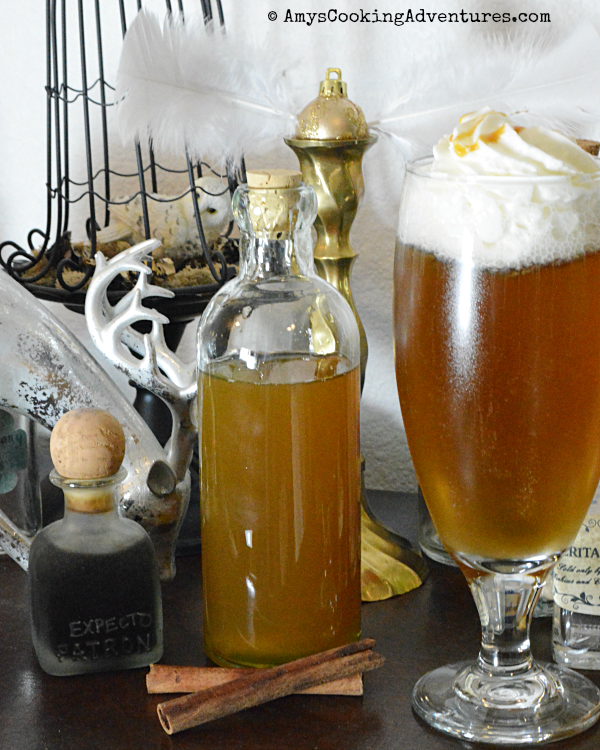 So he really wanted me to make “real” butterbeer. And after he insisted (a few days later) on obtaining pie pumpkins for homemade pumpkin pie, he also became slightly obsessed with pumpkin juice, so we decided to make both. I’ll admit – I totally cheated on the butterbeer! I just bought some cream soda, added a few drops of butter extract, and topped it with whipped cream and caramel sauce. The boys’ comment on butterbeer (and the following pumpkin juice) was “Mom, this is real butterbeer (pumpkin juice)!! !, I don’t really like it” hahaha. I gave both drinks and try and thought the butterbeer was pretty much just cream soda (because it is). And let’s be honest, I really didn’t have high hopes for the pumpkin juice in the first place. As I was researching, many of the recipes included pumpkin puree mixed with apple juice. Nonsense, thought I. After roasting and pureeing pumpkins, tons of liquid is strained out (pumpkin juice! ), so there’s no real need for the puree. However, unless pumpkin in loaded with spices and sugar, it’s really not all that flavorful. I ended up adding a bit of honey, apple juice, and spices and gave it a simmer. Once I tried it though, I wasn’t a huge fan. The flavor was good, but it was really thick and almost syrupy. So I poured it in my coffee. Ding ding ding! Now that’s the ticket! 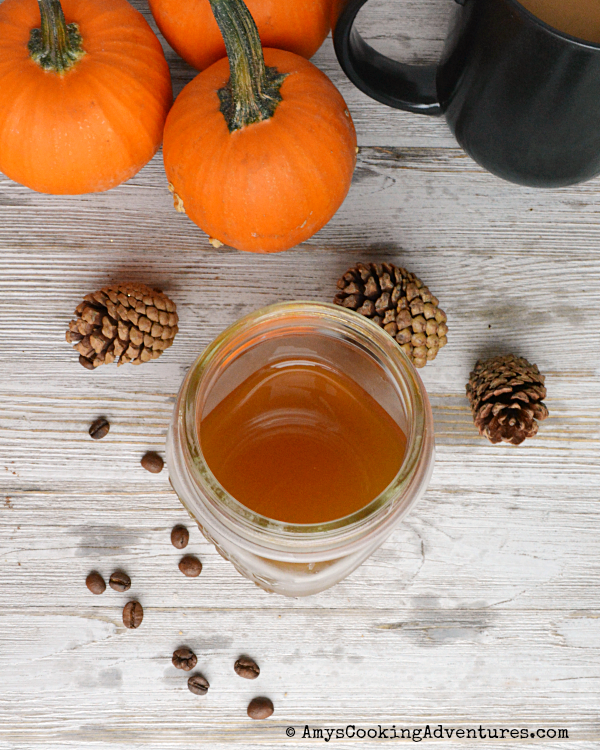 While attempting pumpkin juice, I happened upon the perfect pumpkin spice coffee syrup – made with real pumpkin juice! Cut the pumpkins in half and remove seeds and pulp. Place the pumpkins, cut side down on a rimmed baking sheet. Add 2-3 cups of water. Roast in the oven for 30-45 minutes or until the pumpkins are easily pierced with a fork. Flip the pumpkins and cool slightly. Scoop the pumpkin flesh into the bowl of a food processor. Blend until smooth. Line a colander with a paper towel or cheesecloth and set it over a bowl. Pour the pumpkin puree into the lined colander. Set aside for 1 hour or until all of the pumpkin juice drains from the puree. Use the puree right away or measure out and freeze for a later use. Place the pumpkin juice and remaining ingredients and pour them into a small saucepan. Simmer for 30 minutes to infuse the juice with the spices. Skim off any scum and strain out the solids. Refrigerate until ready to use. Serve over ice to drink as juice or add several tablespoons to coffee! I can't wait until Melody is old enough to want to experiment with me in the kitchen. What fun!! I have a recipe for butterbeer that is vanilla ice cream softened and mixed with 1 stick of melted butter and nutmeg and cinnamon. Refreeze and then make floats with warmed cider. JK Rowling could come down from on high and argue with me but I say this is the real butterbeer. It is amazing. Oooh, this sounds delicious. What a fortuitous "mistake" that pumpkin juice turned out to be.